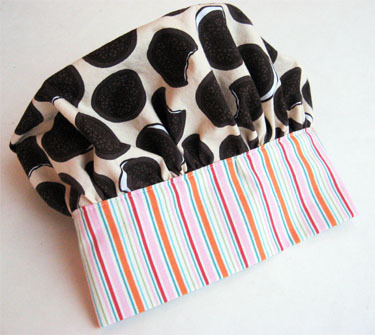 You won’t believe how easy it is to make a chef hat. Just a few steps you can whip one up in no time at all. They make great handmade gifts, especially when paired with a matching apron! Add a few cooking supplies and you have a fun and useful gift! 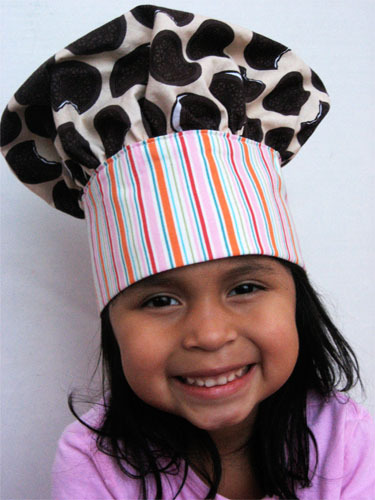 Follow these steps and you will be able to make loads of kids chefs hats! This hat is adjustable so it will fit kids of all ages. Iron interfacing to the 8″ X 24″ piece of fabric following manufacturer’s instructions. 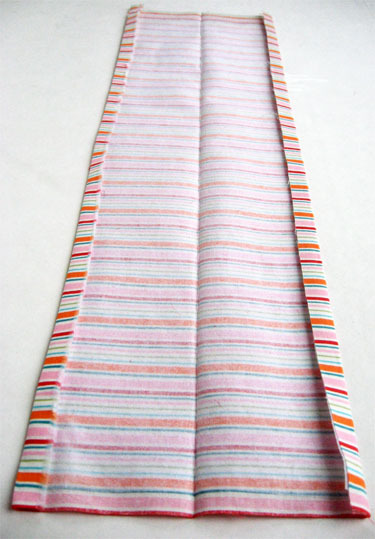 Press fabric in half lengthwise and press each edge under 1/2″. 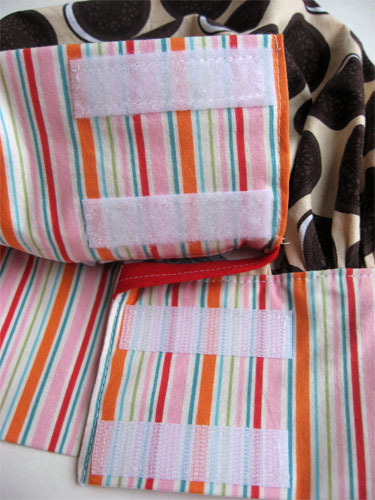 Fold piece right sides together, starting 1/2″ down from the open side, stitch across each end. 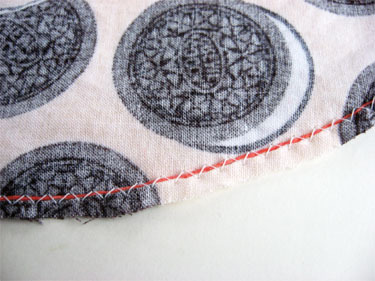 Stitch a 3″ piece of bias tape around an edge of the fabric circle. Around the outside edge of the fabric circle use a wide zigzag to stitch over a piece of dental floss starting and stopping on each side of the 4-inch piece bias tape. Be careful not to catch the floss with the needle. This traps the floss and allows it to be pulled to gather. 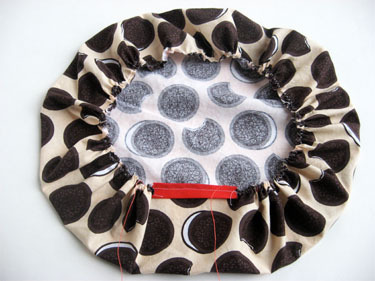 This method is used to gather the circle (as opposed to sewing two rows of basting type stitches and pulling the seams to gather). This starts at one end of the 4″ bias tape that was sewed on previously and ending at the other end of the bias tape. You can always sew two rows of stitches to gather. I prefer the dental floss because I never worry about the gathering threads breaking. Pin the band piece around the gathered edge. Find the center of band and center of the top piece and begin pinning there. Adjust gathers until the band fits the gathered edge, starting at stopping about a 1/4″ over the bias tape on each side (notice how the 1/2″ that wasn’t sewn on each end neatly slips around the bias tape). Pin heavily to keep in place. This takes some adjusting but it is so nice to have all the unfinished edges covered. Sewing very close to the edge, sew band to the top of the hat, removing pins as sewing to keep band flat. It might be necessary to slightly pull the band to keep it smooth. In the back fold left side over as far as the bias tape opening will allow on top of right side. 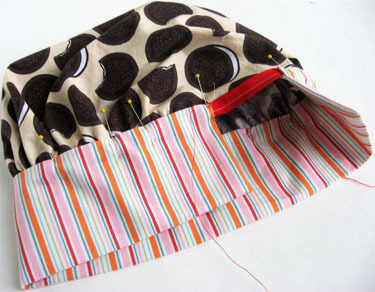 Place Velcro in this overlapping area and sew all four pieces to the hat band. Sew along each edge of each end if desired, to close area placed over bias tape. 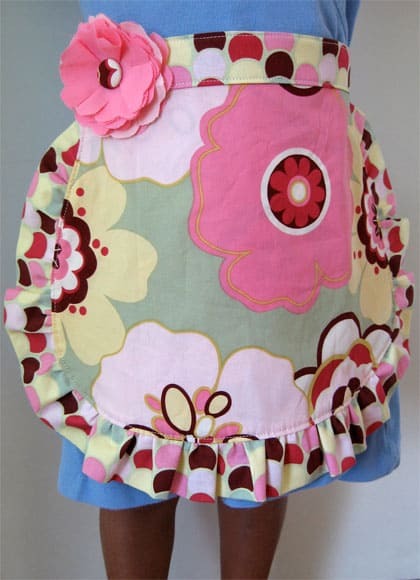 Now you can make this apron pattern to make a cute child’s apron and your child will be the most stylish chef ever! These are a great idea. I am going to be hosting a Kids Can Bake Too fun workshop and this would be great for the kids to have along with their personalized aprons. These are so cute and fun! My kids would love these! Would not recommend dental floss, it can get caught in your machine. I have made several hats and sew front on first and hand stitch the inside. Fun to make and have to revise it as the band is small since I use $1.00 squares, will add 2 inch piece at each end. Trail and error, but have fun. Shirley, I am using a wide zig zag over the dental floss. I am careful to not sew into the floss. This method is a headache save as the gathering threads never break. But yes, be careful to not sew into the floss. Would this fit a 10 yr old and a 5 yr old?? Is the maximum head size 24 inches? Amy, I think it would be okay... you can always adjust where you place the velcro, or add a flap of fabric. Oh thank you so much for this pattern! I made the hat with an apron to match for my granddaughters 5th birthday. I found this pattern simple and could make it in one evening. So cute and adjustable to fit any size! So cute! My sister-in-law made four chef hats for her brother-in-laws. She is gave me your website. Have you a pattern for purchase? Thanks! Hi Bobbie I don't have one for purchase. Enjoy the tutorial for free. It's used to gather the circle (as opposed to sewing two rows of basting type stitches and pulling the seams to gather). The instructions say to zigzag over dental floss (careful not to catch the floss with the needle, I'd guess), effectively trapping the floss and allowing one to pull it to gather. This starts at one end of the 4" bias tape that was sewed on previously, and ending at the other end of the bias tape. The photo was confusing to me because the dental floss is the same color as the bias tape. Louise, thank you! You did a great job of explaining what I meant. You are also right, sewing two rows also works to gather! Thanks for a great, easy to follow tutorial. I made a chef hat for my niece today in just a few hours and it came out perfectly! I wish you wrote all the patterns I have used in the past. I must check out the rest of your posts! Thanks again. Thank you so much for posting these instructions! They are exceptional! A friend asked if I could whip up an apron and hat for her granddaughter. 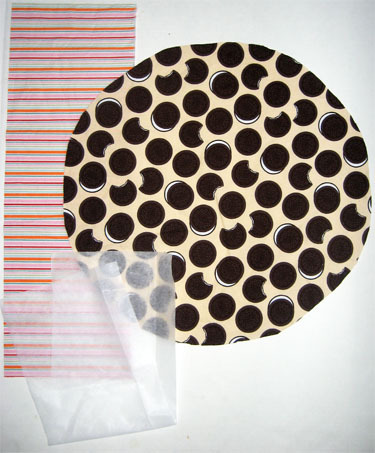 I used a cupcake fabric for the top and a white dot for the band. There was even plenty of room to do some embroidery on the band! This will make a very nice gift for a very sweet little girl! WOW! A friend was desperate foe a chef's hat pattern. I happily told her that my boys ea had one and I had the pattern that was used. Volunteered to loan it to her.......silly me, the hsts and patterns had been in the drawer for over 20 years, and wouldn't you know it? Yep, it wasn't there. I tore up my sewing roo. And all my sewing bins ( you read right, BINS). After searching for hours, it was nowhere to be found. This is, of course Muhy's law. However first thing this morning, as I was getting ready for my day and it struck me! Go online, you poor old thing. (I'm 66 and proud of it, but my brain just works a bit slower these days. Wow, there it was, just perfect. Thank you so very much, because if I should be blesses with another grandchild, I will be ready! Kudos, and you made my day! Thanks Carol! You made my day! Nevermind, I figured it out lol (SLOW moment!). I realize now it says start on one side of the bias tape and sew until the other side (For those who missed it as well, you are not sewing the dental floss on the bias tape at all. You are sewing all around the "puffy" part edge, starting on one side of the end of the bias tape until you meet the opposite side of the tape. Hi! LOVE the tutorial, thank you! I am also confused about the length of the dental floss and how it works to pull, if its only the length of the bias tape? Confused about dental floss step. How long is the length of dental floss? Can anyone share their experience with this step...or an explanation of how it works? Thanks. want to make one of these and the child's head circumference is 21 inches. Will this design fit a 21 inch head? I found this site on Pinterest and decided to make the chef's hat for 2 of my grandsons. I've been sewing for over 50 years so I'm not a dummy when it comes to sewing, but for the life of me, I was not able to figure out how that little piece of bias tape went in to enclose the seam at the back of the hat. I looked at the pics many times, trying to decide if that little bit of seam was encased or just stitched on the outside. Still ain't figured it out! I ended up doing it my way but sure would like to know how you did it. I am stumped and it's driving me nuts. Thanks a bunch. 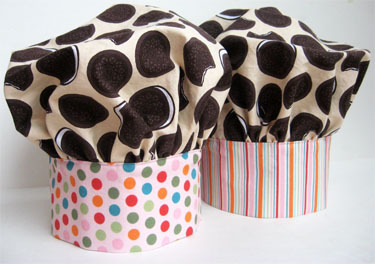 I did a google search for chef hat tutorials and was so glad yours popped up! I just made this for my nephew and it is super cute. My son tried it on for me and immediately said, "Next Christmas, can I have the same thing as Jamie." Thanks for the great instructions! So glad you liked it! Thanks for the feedback. AWESOME tutorial! My 7 yr old is having a "cooking party", so I'm making these for her guests. I'm using fat quarters that I won in a giveaway (low cost!). So I can't do 8x24 but am doing 8x22. This doesn't allow for the overlap for the velcro. So, I sewed in a 3/8" piece of elastic (something I had on had because it was miscut for it's intended project (reusing "waste" = low cost!). For the first hat, I cut 2 pieces of elastic 1.5" long and sewed them in the back. I'm playing with the right amount of spacing in the gap and length of elastic. This first one, there is about 3/4" - 1" gap with plenty of stretch in the elastic to accommodate a 7 yr old's head and allow for growth. I can even wear the hat (but my 7 yr old has a big round head!). I put it on my tiny 5 yr old and where it is still a little big, it does stay on her head! I may try to embed the elastic in the seams for a cleaner finish. We'll see how that goes. If not, this method is working fine. Thank you so much for this wonderful pattern. I love it! Santa is bringing my 3 year old twin niece and nephew a play kitchen. I'm supplying the Melissa and Doug food. This adorable hat is absolutely perfect to go along with the theme. I'll monogram their names on the band. Our paper forage hat is just 20$ per carton,and the material is 100% wood pulp paper.You will feel comfortable when you use it..We have 18 years international export history. Your prompt reply is highly appreciated.Looking forward your prompt reply. I just made one for my daughter. I love it! I can't wait to make one for all of her friends for her birthday party. Very cute! I have a pattern for a chef hat but I like your instructions a lot more! I am going to decorate my smaller Christmas tree with all my "I Love Lucy" ornaments. I want to cut pattern in half to use as a chef hat tree topper. I thought it would match the candy factory theme. Since this is for a tree and not to wear, I wonder if it could be made without sewing? My machine needs adjusted and no time to have it repaired. I found these lovely chef hats for my Bakery party for my little four year old's birthday party. After searching through several other tutorials, I found yours to be so helpful and easy to understand. Thanks for taking the time to make this easy for me! Seven hats down in about three hours! Thanks! Oh, and I"m linking back to you from my blog. I made these for my daughters birthday party, thanks for the tutorial, they turned out so cute! 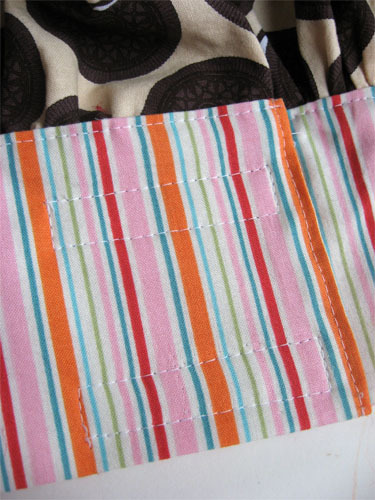 Where did you get the fabric from- I love the cookies?? Also where is the cheapest yet nice selection to go for fabrics? Rachel I bough the fabric from Above All Fabric. I am sorry I don't know the name, but Melanie, the store owner, is great and I am sure can help you! Amanda, I actually think it would fit both a five year old and two year old. The velcro strip in the back makes it adjustable. If you are concerned, you could make the strip of velcro longer to provide more adjustment. Thank you for the pattern and tutorial! They came out really neat! The kids will be thrilled. Thanks so much! I've been looking for a pattern like this for my niece! This is adorable! Thank you for a wonderful pattern. My daughter would absolutely love this! Actually, I bet all 3 of the big kids would love it. Thanks for the tutorial! Thanks so much for sharing. I'm making the hat and the apron for a little girl's birthday party present. I really appreciate the details and the awesome pictures that describe the process very well. I made this hat and a matching apron for my daughter. It came together very quickly and the design is easier/less complicated than other chef hat "how-to's" I've seen. My daughter did not want to take it off. Great project! This is adorable! The instructions great and the pictures even better! Thanks for sharing! OMG!!! I love it! I DO own a sewing machine. I might just have to get it out to make one of these! Or let Annie try it! She is wanting to learn to quilt - are you up to teaching her that? Love you! I enjoy your blog so much! Been lurking for a while. :) Thanks for all your great idea. Soo cute! Think I can make 12 for my daughter's party in February?? I am filing this at thecraftersfilebox.com. Thanks so much for sharing!! DARLING! Thanks for sharing and taking the time for a tutorial. You're great, as usual! A great idea for little girls and boys. Merry Christmas. These'll be great for my girls upcoming birthdays! Thank you so much. You save me with all your great gift tutorials again and again! 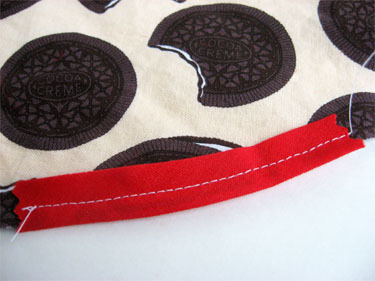 i love the oreo cookie fabric. so cute. Very cute! I love that it's not just a plain white chef's hat. Merry Christmas to you, and thank you for all the work you put into your site. I love everything that is on your site. You should have a magazine or books with all the stuff you have on your website. I can't wait to see it! My son asked for one for Christmas, but it was the last thing on my list and it's not going to get done. Maybe it will be a belated gift :) Merry Christmas! OMG! This is sooooo cute! I will wait patiently for the holidays to be over and 'til you have time to share your tutorial.... Merry Christmas! This is just too cute. Will make some for my little grand-cooks. Love your site. Thanks for sharing your talents with the rest of us. So adorable! I can't wait for the tutorial so I can make this for my little sis who loves to bake!